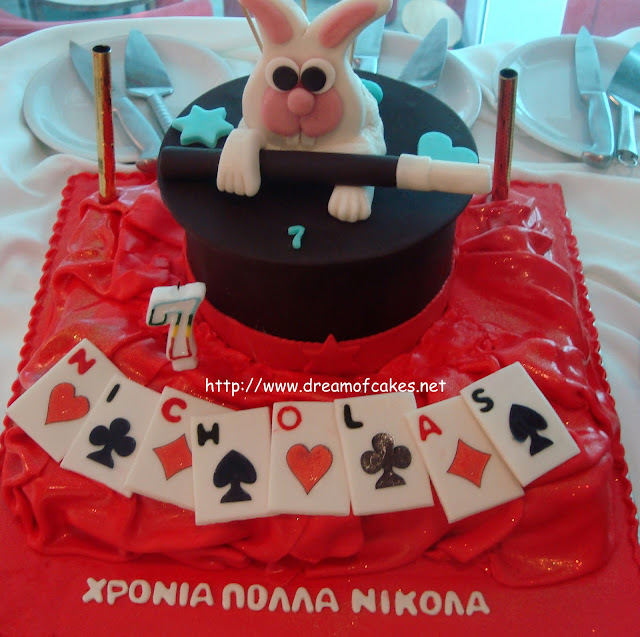 This was Nicholas birthday Cake which was actually made in 3 steps. 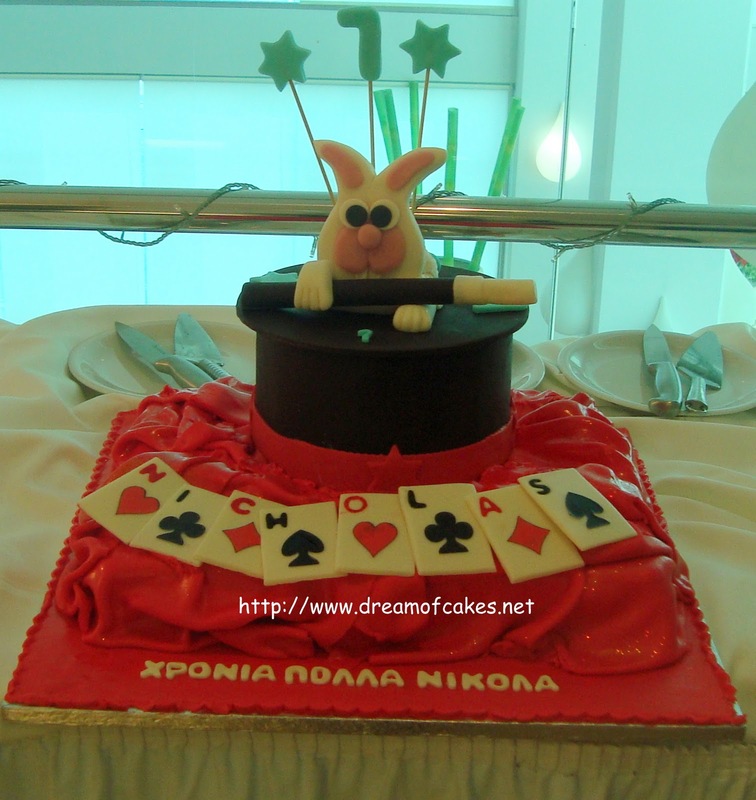 In a previous post I showed to you how I made the Edible Magician's Playing Cards, then I made the Magician's Hat and the cake. 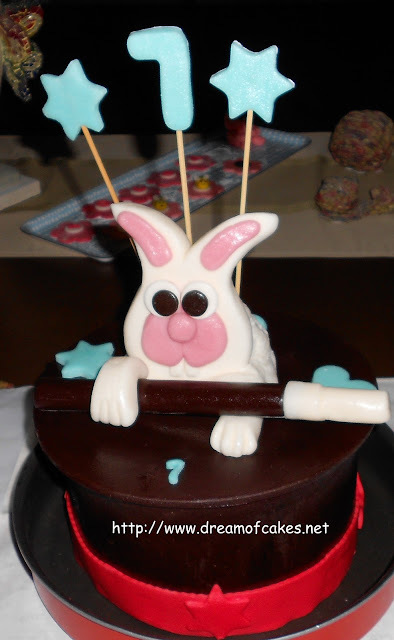 Actually the cake was prepared by somebody else, but I have to admit it was very tasty! Nicholas was very pleased with the result and I was excited to see him enjoying his birthday cake. The hat was made almost a month before the birthday party, because I wanted to be sure that I would have enough time to fix any possible mistakes or unexpected "accidents". I used fondant with Tylos Powder for all the hat decoration. It worked out pretty well! When all the pieces were put together, I brushed the whole hat with vodka, so there were no excess powder sugar left. I wish Nicholas a Happy Life and I hope that the next year's challenge will be fantastic as this one!!! Aw, such a cute cake! You did a great job on the hat! Beautifully designed, fun and playful, another awesome cake! Gosh, you are an amazingly, creative lady - such an artist! Awesome cake! This is so cute!! One of my favorites for sure! It is soooo cute! Makes me want to go and bake something too... Great job! I think this is my favorite cake! It's just stunning! Happy Birthday to Nicholas! Wow, very impress with your beautiful cake. Thanks for sharing. Have a nice day. Happy birthday to Nicholas! 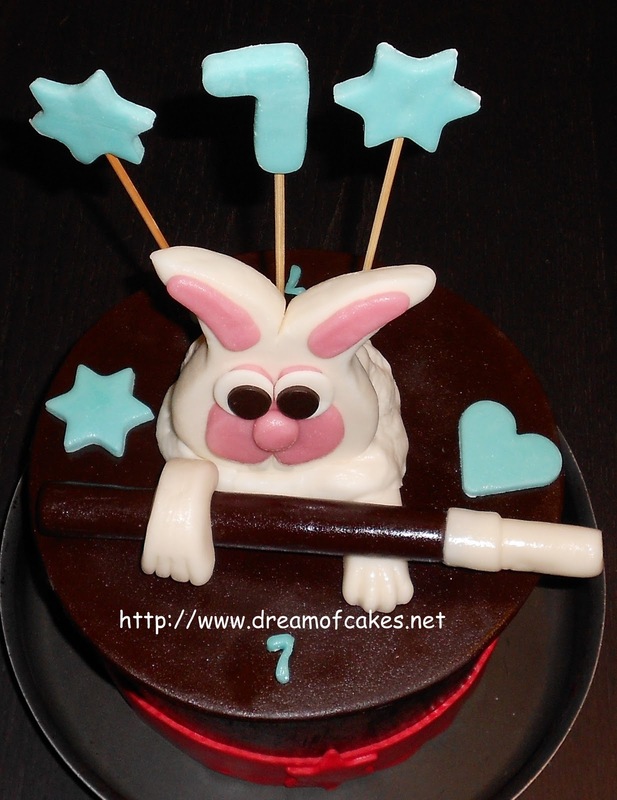 This cake is so cute-love the character in the fact of the bunny. How wonderful it must be to have the talent to create such amazing cakes and bring a smile to a childs face! have a great day! This is absolutely incredible! Wow, I can't wait to check out the rest of your cakes now! Here I go! This is lovely and such a cute expression the rabbit's face! I am sure he is thrilled with it. I remember those playing cards! They're still awesome :) So's the bunny in the hat! WOW! 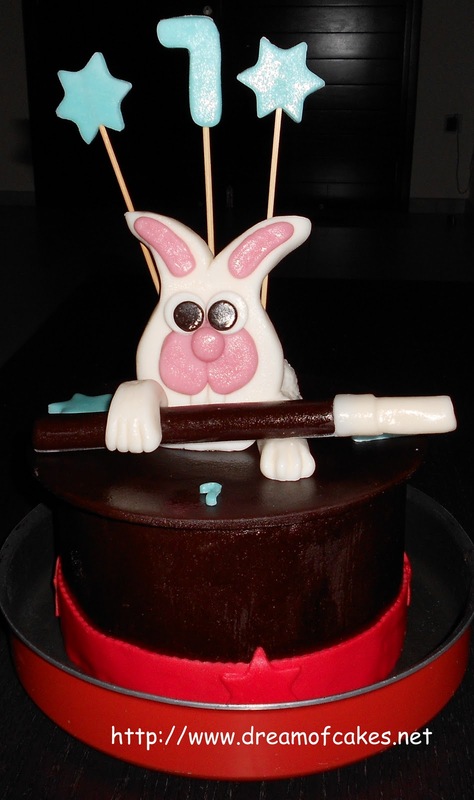 You have done a brilliant job on this cake Efty , I love it , really brilliant :D.
This is phenomenal!!! What a cute bunny! You are so talented! Love your cakes! The magician's cards are so cute! Thanks for stopping by my blog! Following yours - Can't wait for more fun and beautiful cakes! You are wonderful! You made it look so easy to make. This is so cute! Oh my goodness! This cake is just adorable. You are a true artist. What an amazing cake! I absolutely love it! Oh my! You're so talented! The cake looks lovely! I would have loved to indulge in this sweet treat-yum! It is also stunning and unique. Efty-I am glad to have you as a friend and have the opportunity to see all the results of your talent, keep the amazing creations coming! My God! I am just speechless. You are incredibly talented and such a creative person. Fantastic job!! !